ExcelDecryptor 1.3 Free Download - Reset MS Excel Spreadsheet (*.xlt, *.xls) passwords with guarantee. 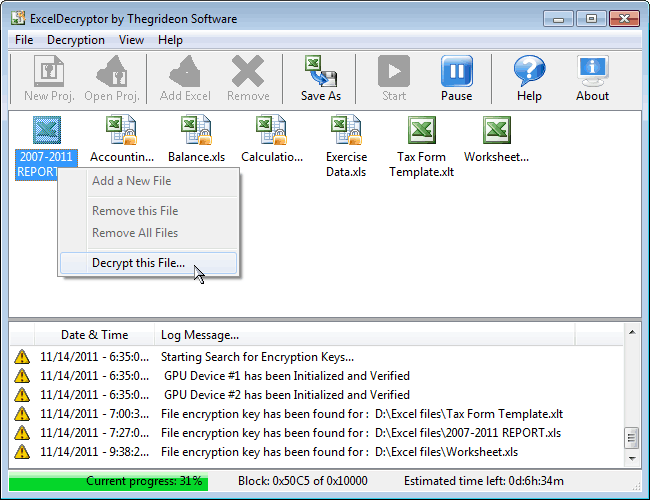 ExcelDecryptor by Thegrideon Software allows you to reset MS Excel spreadsheet and template (*.xls, *.xlt) passwords with guarantee. The unique feature of this tool is the ability to process any number of Excel files simultaneously without any noticeable affect on performance. ExcelDecryptor works with all MS Excel documents saved with Office 97/2000 Compatible encryption (*.xls files saved from Office 2007/2010 and Excel XP/2003 files saved with the default settings). Shared Workbook, Write-Protection, Workbook and Sheet passwords are recovered instantly. Excel Decryptor allows you to recover access to all your MS Excel documents in hours with any modern CPU (like Intel Core i7) or a min-range GPU. Statement: First, please download the orginal installation package by clicking the download link. Of course you may also download it from the publisher's website. Using ExcelDecryptor crack, key, patch, serial number, registration code, keygen is illegal. The download file hosted at publisher website. We do not provide any download link points to Rapidshare, Hotfile, Depositfiles, Mediafire, Filefactory, etc. or obtained from file sharing programs such as Limewire, Kazaa, Imesh, Ares, BearShare, BitTorrent, WinMX etc. Software piracy is theft. If you like ExcelDecryptor please buy it.